By Contributing Author 1 Comment - The content of this website often contains affiliate links and I may be compensated if you buy through those links (at no cost to you!). Learn more about how we make money. Last edited April 3, 2017 . Excerpt used with permission from Never Enough? 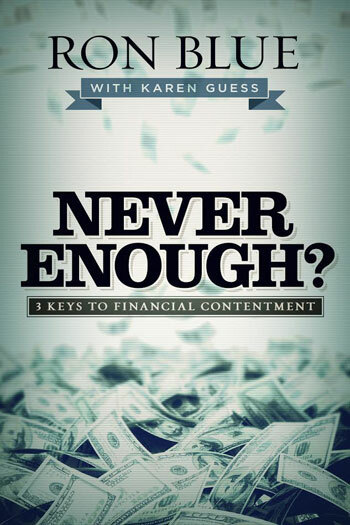 3 Keys to Financial Contentment by Ron Blue with Karen Guess Copyright 2017, B&H Publishing Group. Excerpt taken from Chapter 6, “Live,” pages 92-95. As adults, most of us can recall a time in our early or mid-twenties when it dawned on us that our parents weren’t going to show up to guide us through a particular situation. Anything from figuring out how to turn utilities on in a new home to buying a car alone for the first time to having a baby can be our wake-up moment to adulthood. The wake-up moment holds fear and freedom, both because adulthood is a whole new world and because it’s now up to us! When our kids were growing up, Judy and I had a saying that we used a lot (Remember, we had five kids, so we were big fans of parenting mantras that could be repurposed!). Whenever one of our children would have the privilege of getting a new level of freedom— a phone, a trip with friends, a car, etc.—we would remind them “with freedom comes responsibility.” Now, this idea is not rocket science, but it’s entirely true and 100 percent reliable. Freedom and responsibility are two sides of the same coin. In fact, God is pointing out this fact to us in 1 Timothy 5:8 when He tells us that, as grown-ups, it is our responsibility to provide for the needs of our family. What if I’m called to ministry and my salary just won’t ever be very much? What does provision mean . . . is it just the basics, or is there something more to it? What about two-income families versus one-income families? How does the issue of provision play out in these scenarios? What about the “extras”? Does the provision umbrella include things like second homes or nice vacations? At the heart of each of these questions is one that every adult needs to answer for himself or herself and that is: “What is provision?” Determining what provision means for you can be a big dilemma, largely because it raises the deeper and very personal question, “How much is enough?” Provision itself is relative depending on the individual. To some parents, it means private school for your children. To other parents, it means a roof over your kids’ head and food on the table. To some of you it means avoiding college debt or paying cash for a car at sixteen. To others it means paying the electric bill or taking care of an aging parent in your home. By answering “How much is enough?” and making an intentional, ahead-of-time decision about what provision looks like in our financial situation, we begin to make peace with the Live wedge of the pie. The world will always tell us that the answer is “more.” More than we have today. More money. More stuff. More upgrades. More. God’s Word speaks to the issue of wealth and “more.” Some key verses are very straightforward and remind us that money is a tool; it is not an end. As soon as wealth (or the pursuit of it) becomes our obsession, we are in dangerous territory. Paul cautioned moderation when he said, “But if we have food and clothing, we will be content with these” (1 Tim. 6:8). Jesus said that when our possessions own us, it is impossible to also be devoted to God. “No one can be a slave of two masters, since either he will hate one and love the other, or be devoted to one and despise the other. You cannot be slaves of God and of money” (Matt. 6:24). And, while the Bible doesn’t condemn wealth, it does condemn the love of wealth. “For the love of money is a root of all kinds of evil, and by craving it, some have wandered away from the faith and pierced themselves with many pains” (1 Tim. 6:10). So, there is much wisdom in Scripture to guide us in answering, “How much is enough?” But at the end of the day, the answer to this all-important provision question is that it ultimately comes down to a faith journey between you and God. I recently met two young men who graduated together from Harvard Business School. While there, they took a class called “God and Money” in the divinity school. They researched the “How much is enough?” question by looking at other business school graduates’ level of income, their level of contentment, and their level of generosity. Along the way, both young men were deeply challenged to wrestle with the same question themselves, before the Lord. Best friends and accountability partners, each sensed God’s leading in entirely different directions on the provision question. One, who had planned to enter into international business (and already had a lucrative job offer), sensed God leading him to go into ministry and to make a career of spreading the message of generosity. The other young man distinctly believed that God was leading him to take a very well-paying job, but to set a lifestyle cap from the very beginning of his career. Determining what provision means for you (i.e., knowing when enough is enough) is a very important and very personal journey, no matter where you are in your career path. If you are young, answering the question will help guide many lifestyle-related decisions down the road. If you are older, answering the question has a way of freeing you to set finish lines that allow you to pursue other God-given passions and goals. No matter your age, answering the “How much is enough?” question as you provide for your family gives you the freedom to say yes to some things and no to others. You will be able to hear the world’s inevitable “more” messages as passing static rather than letting it drown out the priorities in your life. You will be able to live in greater unity with your spouse, knowing you’ve agreed to the finish lines ahead of time. You will be content with what you have—the size of your pie—because you will have a conviction that runs deep. Last Edited: 3rd April 2017 The content of biblemoneymatters.com is for general information purposes only and does not constitute professional advice. Visitors to biblemoneymatters.com should not act upon the content or information without first seeking appropriate professional advice. In accordance with the latest FTC guidelines, we declare that we have a financial relationship with every company mentioned on this site. Seeing how so many people struggle to cover even the most basic needs, I’d say once you’re able to pay for the roof over your head, buy food and offer a sense of security to your family (and to yourself), you’re doing great and should be grateful!